STOP damaging and throwing away screws! This 8pc kit is outfitted with premium VESSEL brand Japanese hand tools. It’s the perfect "Starter Kit" for restoring or repairing Japanese motorcycles, which have JIS (Japanese Industrial Standard) screws. The included “Megadora” style screwdrivers have a non-slip cushion grip handle for maximum comfort. The high precision black point cross-point tips fit JIS (Japanese Industrial Standard) screw heads, and can also be used in other cross-point screws. This ensures a correct fit for fastening and helps prevent cam-outs. The included 980 model "Impacta" is a revolutionary screwdriver that features a built-in impact driven screw removal function. It's great for stripped, rusted, or stuck screws. "We couldn't have done this build without Vessel tools from JDV." Subscribe to receive our NewsFlash featuring new products and specials. Receive new product updates and special promotions for VESSEL hand tools. 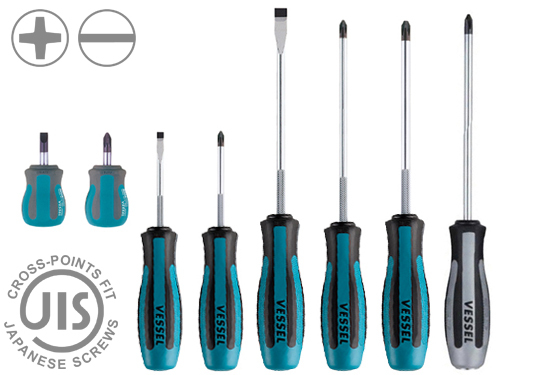 Receive new product updates and special promotions for VESSEL anti-static tools. Receive new product updates and special promotions for VESSEL nippers and blades, and EOAT components. 2019 JDV Products, Inc. | All rights reserved.